The area of Front and Lower Sherbourne Street is currently a skyscraper free zone. There are plenty of tall towers nearby, of course, but the immediate area remains one of relatively low (literally and figuratively) development despite its valuable location. That might change, however, if the City approves the Pemberton Group's large-scale development proposal. That proposal calls for the overhaul of an entire city block, which will stretch from Front Street to the north, Lower Sherbourne to the west, Princess Street to the east, and The Esplanade to the south. Currently under review by the City of Toronto, the project will include two residential towers of 34 and 33 storeys, connected to 13- and 17-storey base buildings. In its current incarnation, the proposal also includes plans for an underground garage accommodating 913 parking spots, as well as retail or commercial spaces at ground level. The area in question (177 - 197 Front Street East) is currently occupied by a Sobey's grocery store and an Acura dealership — not exactly beacons of urban development. But to say this proposal will bring new life to the area is undoubtedly a gross understatement. Count 'em — a whopping 1,663 units will occupy the spot if approved, with 795 units in the first tower and 868 in the second. That means this block — which currently only sees the odd ILX shopper or commuter picking up milk on the way home from work — will see a massive increase in activity. It will also see new heights that are pretty substantial for the immediate area. Nevertheless, there are obvious kinks that need to be worked out before this project wins approval. Current zoning requirements call for 1,140 parking spaces for the area; this project includes 913. Drafts also reflect two towers with only one- and two-bedroom units, and we all know three-bedroom suites (with families!) make for healthier communities (right Adam Vaughan?). The tiered architecture does lend itself to plenty of green roofs (which is better than the grey surface parking lot there now), but it also looks a little... prison-esque? Uber-commercial? Uninspired? I'm not sure. But a spot sandwiched between the Distillery and St. Lawrence Market ought to dance with a little character, and (from up here on my inflated high horse) it doesn't seem like Pemberton is playing with a whole lot. 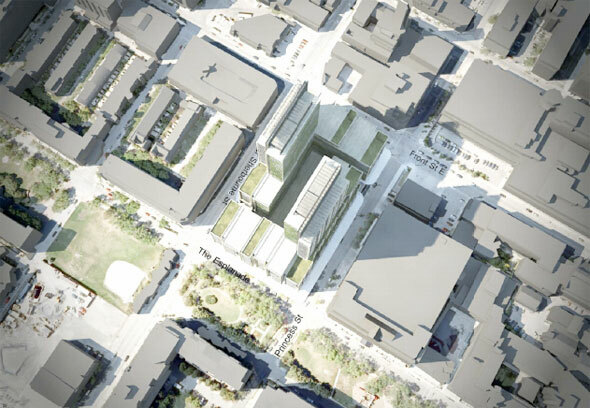 The real question, though, is whether Front and Lower Sherbourne can handle a project of such massive scale. Will it be a much-needed area overhaul, or simply overwhelm?